The first thing we must be aware of is that the new law shall be illegal. It will be approved through an enabling law that was itself illegal. And the old labor law was an "organic law" meaning that it was voted by more than 2/3 of the parliament and as such IT HAS to be changed or be re-voted by a 2/3 of parliament. Indeed the regime knows that very well because in all cynicism I suspect that they will publish an unworkable instrument but with hopeful electoral benefits just to have some lawyer succeed at trashing it in court, any time after Chavez is reelected. Then a new law will be discussed and voted. Maybe. The second thing to understand is that the regime is skilfully playing the ignorance of the people (assuming that they are understanding what they are doing themselves and not victims of their own ignorance). In a pseudo-revolution which has aimed at creating a complete dependency between the state and the citizen, a XXI century form of slavery directed by a tiny elite, there is one basic concept that no one, NO ONE, seems to understand: the more benefits you give to workers, the more depressed their base salary. Let me explain in case some of you, probably chavistas still reading, do not understand. Let's say that you need a job done. That job is worth to the company 100 Units. So you may hire a worker for 90 Units, the 10 excess units being your return on investment, the upgrading of the business process, the rainy day fund, the seasonal variation of income fund, etc.... This in a country were inflation is at a reasonable 3% rate. In Venezuela with a 30% inflation, in theory the on paper margin should reflect 70 units at most for the worker, something that is not happening, but I digress. In other words, in XXI century economy the real margin of return for the owners of companies rarely pass the 5% (unless of course you deal in glamour Apple-like stuff). And even if we were dealing with slave owner commie Chinese entrepreneur who make 50% returns, you would still be paying your worker at east 40 units. So, how do you give those 90 units to your worker? Does that mean that you divide it in 12 parts and give a share once a month? Not at all. In the current legal system of Venezuela, with onerous severance laws, ridiculous food stamps obligations and what not, it is fair to say that the 90 units are divided in at least 18 parts. That is, if you were having a base salary US style you would be getting 7.5 units a month but in Venezuela you get at best 5, and lower as needed. You will get two extra 5 at year end, and another 5 through the business mandatory food stamp. That is about 75 units. The remaining 15 units you will get them AFTER you leave your job, someday, after inflation has been eating a nice chunk out of it. And that in the private sector because if you are a public servant you may not get the 5 in food stamps, nor the 15 owed you until years after you were fired or retired. If you get them since no court will rule against the regime (courtesy of Aponte^2 own words). Of course the numbers above are a gross approximation for the sake of a quick understanding and the actual number of shares varies according to your job, skills, etc... But the principle is the same: an employer hires you for what you are expected to bring the business and he will pay you a monthly fraction of that depending on the investments required for you to do that job. You may divide your share in 12 or 24, but in the end you cannot get more than your share because otherwise the business will go bankrupt, or in Venezuela start getting state subsidies until someday it finally collapses under its own weight (aluminium industry anyone?). In addition they will enshrine the "stability" a work, meaning that it will be nearly impossible to fire anyone unless the regime approves it, increase penalties in case you fire them anyway, give a maternity leave of 6 months, forbid to fire father or mother for two years after a baby is born, reduce the working day to 7 hours (while making that free hour a training time in revolutionary propaganda payed for by the employer), and such other stuff we keep hearing. We do not know how many of these goodies will find their way in the final bill but you may expect the worse! To top it off, all the severance deposits that must be deposited by the employer in a special fund will be now managed by the state which will pay your severance. Some day, when it can, when they like your paper work, when you bribe everyone from the doorman to the Cuban boss....... After all we have the recent example of how the pension fund of the roja rojita PDVSA was squandered away by speculators in the US who are facing justice there but no word at home from the people supposedly in charge of protecting those pension funds. How do you think employment will go after such a law is enacted even if only half of these threats are fulfilled? In the graph on the left from Tal Cual today you can observe yourself how unreal that law is (and those are not very credible official numbers from the INE but let's accept them). In Venezuela in 2011 there were 6.9 million folks with a job, "ocupados formal" (the INE considers a job any activity that busies you 10 hours a week). AND 5.4 million that work odd jobs, "informal" here and there and that do not belong to any state social service, 13YEARS after a socialist revolution!!!!! They do not pay taxes, of course, unless you count the bribes the buhoneros must pay the Nazional Guard to set shop in the streets. Of the 6.6 you need to subtract the 2.4 million of the public sector who will benefit or not but who will certainly be blackmailed by the regime to keep their job by voting Chavez and staying quiet no matter how late their paycheck comes. In other words Chavez's crowd is secretly organizing a law for the 4.5 million in the private sector "privado". The objective is clear: to create social tensions during the next months and win away as many as possible of these workers to the chavista side in a blackmail of sorts, meaning that only Chavez can force private sector to give you the 110 units for your 100 unit job. All of these could have been avoided if chavismo were a responsible left wing regime (oxymoron?). For example we could have done away with the cumbersome severance plans by creating a jobless insurance which covers workers for 6 month (the average severance payment by the way for somebody working a couple of years). Still, for unjustified layoff we could have retained a severance payment. Also, instead of building barrio adentro we could have focused on restoring hospitals and create a real social medicine, complemented with a renewed network of ambulatorios which already existed and today seem to work better than many of the barrio adentro CDI.... At least when they are in the hands of opposition local managers. In other words, the reason of the severance (antiguëdad) was for jobless time and to borrow in case of medical trouble. If those services existed, really, we would not have this discussion today. We have Sukhois instead and a cadaver on line with Cuba. Instead we are headed into a sever downturn in employment, in a further loss of competitiveness, if possible, in a clear discrimination in hiring women who are building a family (1), etc, etc.... In other words, final paralysis followed by progressive bankruptcy of the private sector. This is good for the regime of course since the bolibourgeois will benefit for their business of the indulgence of the courts and remain in place while screwing their workers just as the state is doing currently. Rule of thugs, by thugs, for thugs. Update: believe it or not but Chavez signed the damn law today WITHOUT publishing it. He claims that he is waiting for the high court to rule on its constitutionality. After the Aponte^2 affair we know for sure that the less constitutional the law, the fastest it will be approved. 1) In this very macho society it is the woman who bears all the charges. Progress would have been to force the father into post natal care of the baby while the wife returns to work, or at least force the business employing the father to shoulder some of the costs of the business employing the mother (like it happens in many civilized countries). But no! More macho posturing! More macho message that a woman's place is home! What a great revolution!!!!! The Maicero, in Spanish, or Oriole Blackbird in English, has as Latin name "Gymnomystax mexicanus" and yet it is not so much typical of Mexico as of Venezuela and a few other South American countries. The picture above, from Commons, was apparently taken very close to my home town, in the Caribbean. Die Kaufkraft der Venezolaner war zwischen 1950 und 1978 am höchsten. Deswegen haben viele Venezolaner Chávez beim ersten Mal gewählt: sie dachten, er würde entweder den Wohlstand UND Sicherheit zurückbringen, die sie während der Herrschaft des Diktators Pérez Jiménez - ein Idol des Chávez- erlebten oder den Wohlstand der Zivilregierungen von 1973-1976. Der Wissenschaftler Miguel Angel Santos vom Wirtschaftszentrum IESA hat jetzt jede Menge Daten analysiert und ist zum Schluss gekommen, dass die durschnittliche Kaufkraft des Venezolaners im Jahr 2011 die von 1966 entsprach. Das sagt uns El Universal heute. Die Produktivität der Venezolaner, sagt uns Santos, ist einfach so niedrig wie nie zuvor. Es wird nicht mehr in Kapitalanlagen investiert. Die Ökonomen haben mehrere Erklärungen für den Produktivitätsschwund. Politische Entscheidungen spielen dabei eine grosse Rolle: Gesetze wurden nicht respektiert, Eigentumsrechte wurde verletzt, der Arbeitsmarkt geriet auch in Ungleichgewicht. Mehrere Analysten nennen mehrere konkretere Faktoren. Die Währung wurde zB aus populistischen Gründen immer wieder überbewertet - so wie jetzt-. Zuschüsse wurden bedingungslos vergeben. Preiskontrollen wurden allzu oft eingeführt. Administrative Kontrollen wurden zu Last, gleichzeitig wurden Steuerausnahmen für politische Kunden ständig eingeführt. Die zunehmende Abhängigkeit vom Erdöleinkommen und die Schwankungen des Erdölpreises haben dazu geführt, dass die Regierungen extrem kurzfristig dachten und die Zusammenarbeit zwischen Politik und Wirtschaft einfach verschwand. Es gibt einige Faktoren, die ich vermisse. Sie erwähnen kaum die Tatsache, dass sie immer weniger in Humankapital investiert haben - nicht, dass es jetzt besser wäre, ganz im Gegenteil - russische Waffen sind prioritär. Im Artikel wird auch nicht darauf eingegangen, wie die Entwicklung eines Dienstleistungssektors so negativ sein kann. Der Tertiärsektor ist ja überall gewachsen. Was die Wissenschaftler - oder zumindest die Journalisten von El Universal - nicht sagen, ist, dass in Westeuropa, in den Vereinigten Staaten oder in China der Sekundärsektor trotz zunehmender Bedeutung des Dienstleistungssektors immer effizienter wurde. Sie sagen auch nicht, dass der Tertiärsektor in Venezuela eine ganz andere Dimension hat als in Europa oder in Nordamerika. Sie sagen auch nicht, wieso Venezuela eine solche Abhängigkeit vom Erdöl entwickeln konnte, während die Norweger sich streng an Massnahmen hielten, die diese Erdöleinnahmen zur nachhaltigen Entwicklung einsetzten. Wieso, wieso? Irgendwie habe ich also mehr Fleisch im Artikel erwartet...interessante Fakten gab es schon. Hoffentlich hat unsere zukünftige Regierung einige Ideen, um diesen Trend umzukehren. Die Prognosen sind düster: zwischen 2007 und 2010 ist die private Investition um 43.6% gesunken. Ich bin sicher, was die Chávez-Anhänger sagen werden: das geschieht, weil die Reichen ihre Münze horden. 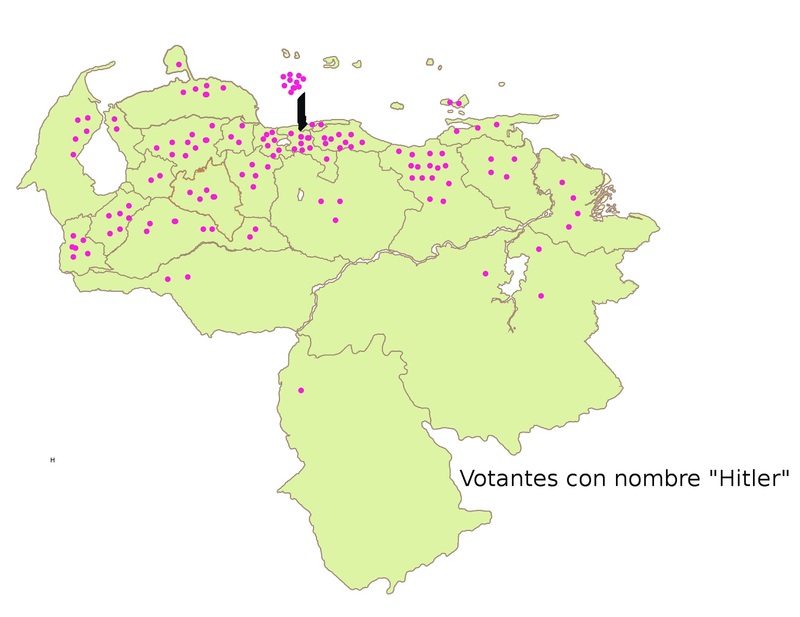 This is weird Venezuela: below you can see the distribution of those Venezuelan voters whose first name (not surname) is "Hitler". 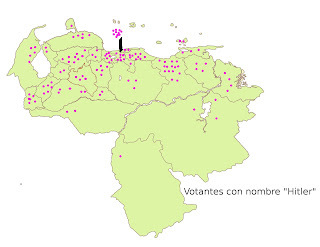 Anzoátegui and Caracas have more Hitlers than other states, but the percentage of Hitlers in Delta Amacuro or Barinas (Chávez's state) is higher. It is not coincidence that 90 years ago the states with the lowest school attendance in Venezuela were Delta Amacuro and Barinas. There is a guy in Barinas whose full name is Hitler Maolenin Leañez Aponte. What is interesting in this map is the extraordinary regionalization of the vote, to an extent that I do not recall having seen in a Presidential election. Except for two exceptions, the South and South West are solidly for the Socialists, who have also transformed Brittany in the West in their bastion, Brittany who was very Catholic voted right wing solidly until the 80ies. The right has switched from its Western bastions into a crescent swath that is only punctured 4 times (the North is socialist ancestral grounds). The second map below is basically the same but I wanted to show how smooth Liberation is. I click on the Gironde department, the largest of France and the one perhaps most representative of the new economy: tourism, trade, gourmet food. Not to mention of Bordeaux, a resurrected splendid city now a World Heritage. 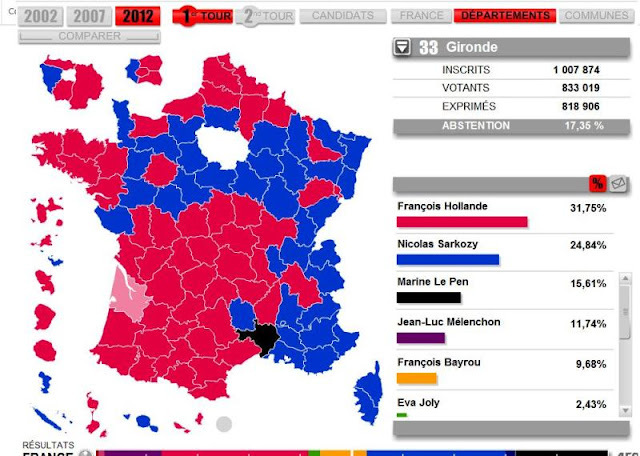 In Gironde, Le Pen is down and Hollande is up and the prosperity and renewal do not seem to have helped Sarkozy at all. But pale pink Gironde has quite a story, and when you double click you get the results for ALL municipal districts. ALL, barely a few hours after the vote. And results, not trends as the Venezuelan CNE left us in the 2007 referendum to this date. The map below is the blow up of Gironde. 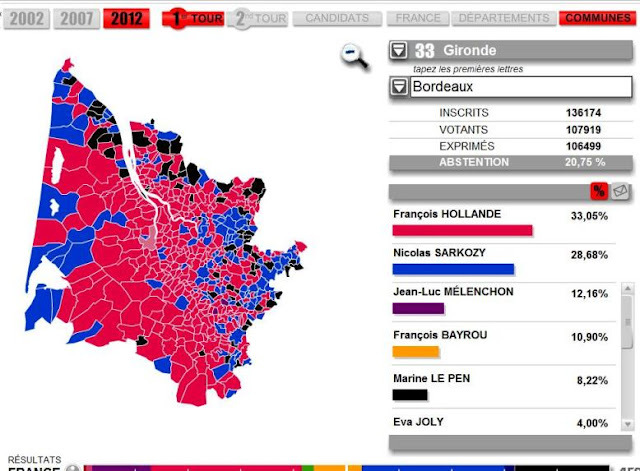 I clicked on the biggest district, Bordeaux, which are thus the numbers you read. And there you can see that solid pink Gironde is quite regionally divided too. All the tourist and resort areas, and the agricultural areas to the East are mostly Sarkozy. Industrial and commercial Garonne valley with Bordeaux are more solidly pink. But the extreme right of Le Pen draws a strange border area crescent in black, even disputing control of the major Bordeaux vineyards of Medoc to the Socialists! Though in educated and cosmopolitan Bordeaux Le Pen is further down. My best guess for that black crescent is an anti European feel more and more found in French traditional agricultural regions. And perhaps more than any other map this one symbolizes the problems of the traditional Gaullist democratic right, the one that created the welfare state in the 60ies and 70ies (it was NOT the socialists who created the French welfare state even though they did plant the idea in the 30ies). The Socialists are not strong, they are beholden to the former communists under Melenchon to ensure a ruling majority. The problem is that the right keeps weakening and that now the Front National is getting its historical best score ever with 18%. I have a nagging feel that Marine Le Pen will play the Hollande card. Indeed, a Hollande government dependent on the tax and spend Melenchon people will likely fail and the Front National in perhaps less than 5 years form now will have a shot at beating the traditional right. Its real goal, if you ask me. 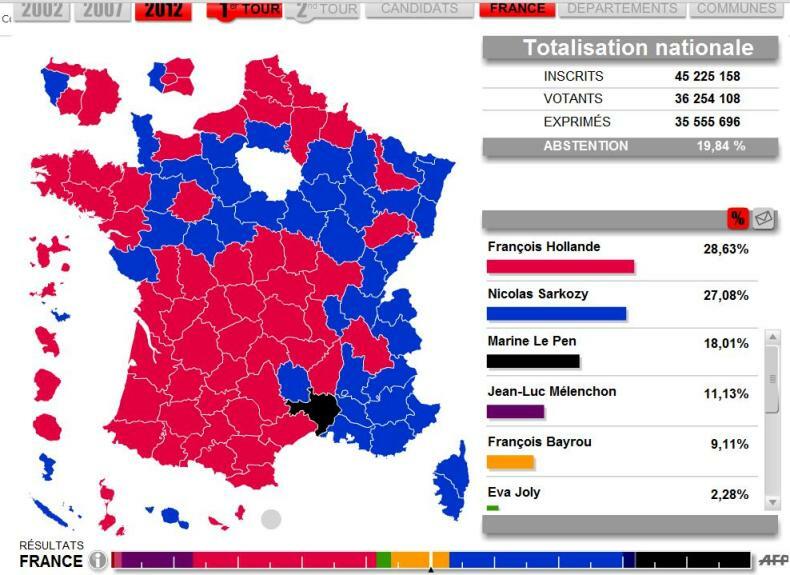 Well, Hollande is about to win but what may turn out to be a useless victory. It is quite possible that Melenchon and Le Pen are going to gamble it all in the parliamentary elections of late May and as such we will get a hung parliament. Right now Melenchon has announced he will support Hollande without conditions. But if Hollande wins, on the very next morning Melenchon will send his bill demanding at least a couple of dozen safe seats for his people and thus denying the Socialists a possible outright majority. They will be subjected to the constant blackmailing to what are, after all, former communists, barely unreconstructed, dreaming of 6th republic à la Chavez. If the UMP of Sarkozy (who has promised to retire from politics on the spot if he is not reelected) does a deal with the FN, it is doomed. And it is even more doomed if it refuses a deal with the FN, risking in this case to lose as much as half of its current seats. The Socialists are certain to use the double standard that they are allowed to negotiate with former communists but the UMP is not allowed any deal with the FN. 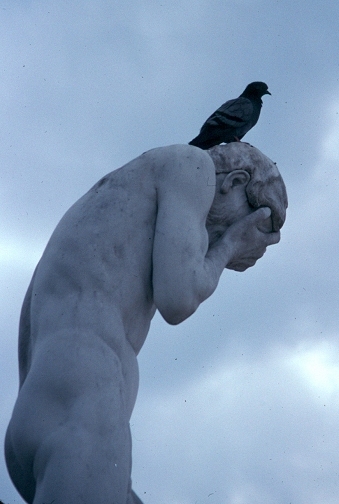 This hypocrite electoral calculation from their part, instead of considering what should be done, namely a grand coalition between Socialists and UMP for a couple of years to take the painful measures by consensus, will only be paid by all of us later, including the socialists. But let's not get ahead of us, we still need to do that second round and pragmatically the best hop is for Sarkozy to lose by no more than a couple of points. Any margin as the ones predicted tonight of at least 6 points is sure to send Melenchon and Marine into a feeding frenzy the day after.